Noble and Greenough School, a coed and 5-day boarding school in Dedham commonly known as “Nobles,” represents the union of tradition and innovation; the harmony of prestige and inclusion. 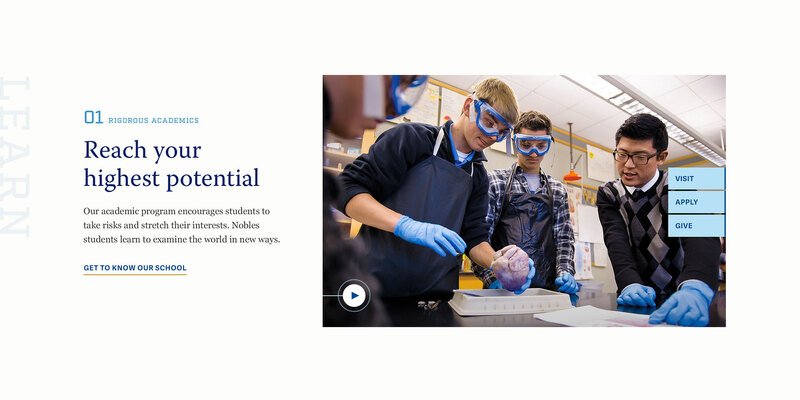 With a brand new website tailored for all devices, Nobles seamlessly weaves together the excellence of their academic program with the vitality and richness of their community. 829 Studios created a visual system for Nobles that feels sophisticated yet warm, clean yet full of personality. Nobles’ strong editorial photography is complemented by rich blues, soft golds, and unique serif typography. The result is an easily digestible, beautifully on brand website that is unmistakably Nobles. 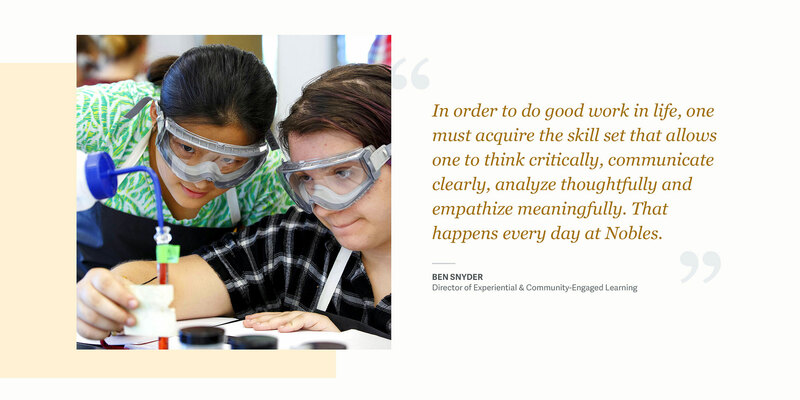 To convey the School’s innovative and forward-thinking qualities, 829 pursued an open editorial layout for the site that feels dynamic and engaging as users scroll through each page. Balancing out this innovative essence are the typography choices: headline typeface Warnock Pro and body typeface Georgia work together to invoke Nobles’ rich traditions, while modern slab serif Factoria feels youthful, reminiscent of Nobles’ target audience. For interactive elements and calls-to-action, the sans serif typeface Adelle Sans cleanly invites users to click, tap, and dig deeper into the site. For more task-oriented pages, like the school calendar, the use of brand blue and subtle greys provide clear hierarchy to the page. Down to the details of date selectors and dropdown menus, the Nobles brand manifests itself confidently in every facet of the site for a truly cohesive visual and interactive experience. Our goal to help prospective students and families imagine themselves at Nobles required us to bridge the gap between the digital and the physical experience. The Nobles campus, when experienced in person, is imbued with warm hues from the wood paneled walls to the stones of the castle. To add warmth to the predominantly blue and white palette, we crafted a secondary color palette of soft golds that complement the primary brand colors and inherently convey excellence. Moments of light gold backgrounds provide structure and focus for particular content sections, while deeper golds serve as rich contrast for visual emphasis. And so we present the completed website design for Noble and Greenough School, a rigorous academic community dedicated to inspiring leadership for the public good. 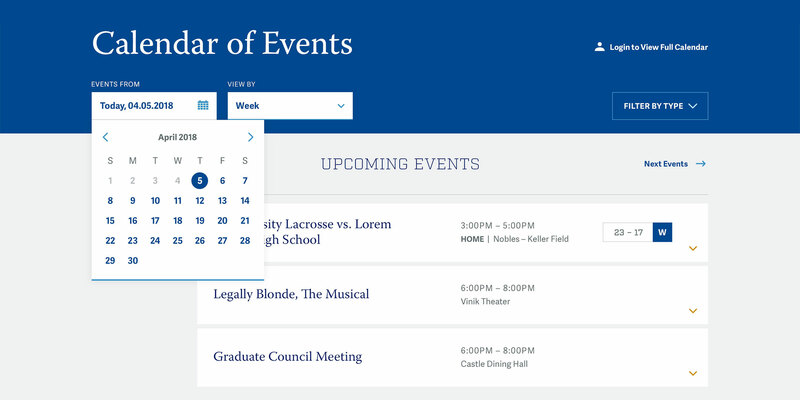 A streamlined web experience and elevated digital brand by 829 Studios makes it easier than ever for prospective families to envision themselves at Nobles and decide to take the next step in their academic career.